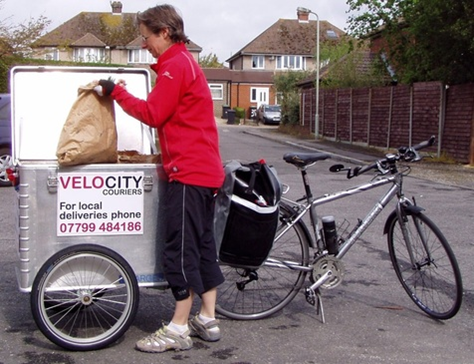 We are often asked where in Kent we deliver our organic vegetable boxes, so here's the lowdown..
We offer doorstep delivery in Canterbury, using Velocity Courier. Andrew and Isabelle provide a wonderful service, and deliver our vegetable boxes around Canterbury using bike and trailer, enabling us to offer an eco-friendly home delivery. We also offer home delivery (by van) in Wye and the surrounding area, including Boughton Aluph, Brook, Hastingleigh and parts of Brabourne/Smeeth. Other than that, we have collection points for our organic vegetable boxes, (usually in customer's gardens) covering a big part of East Kent, including Ashford, Hythe, Saltwood, Folkestone, Lyminge, Bridge, Canterbury, Whitstable and Faversham..